It is necessary in the catering industry to prepare and serve food to the highest standard and in the cleanest environment possible. This lift has two separate compartments the top one for food the bottom for refuse. 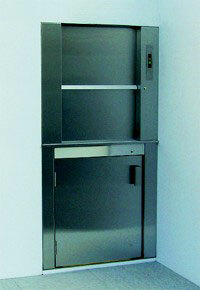 The advantage of this system means that if space is at a premium, one lift will perform the task of two.